When I first got my S2 I filled it up, went and paid and came out to see fuel pouring out from what I thought must be the top of the tank. I risked it, drove for 10-odd miles and got home in one piece with the leak stopped. I put it on the list of things to investigate and vowed not to fill it completely until then. 3 years later and I've got round to it..! On investigation, the small hose that comes out of top of the tank in the rear left corner behind the hose to the filler box is loose - no jubilee clip to be seen. What I can't see is what the other end connects to - it disappears down inside the back of the boot and runs behind the boot lock. SNG show a hose (which looks short in the pic) with a clip each end, so I guess it connects to something well hidden as always? All advice appreciated as always! The hose in question connects to the fuel filler in the rear N/S wing. 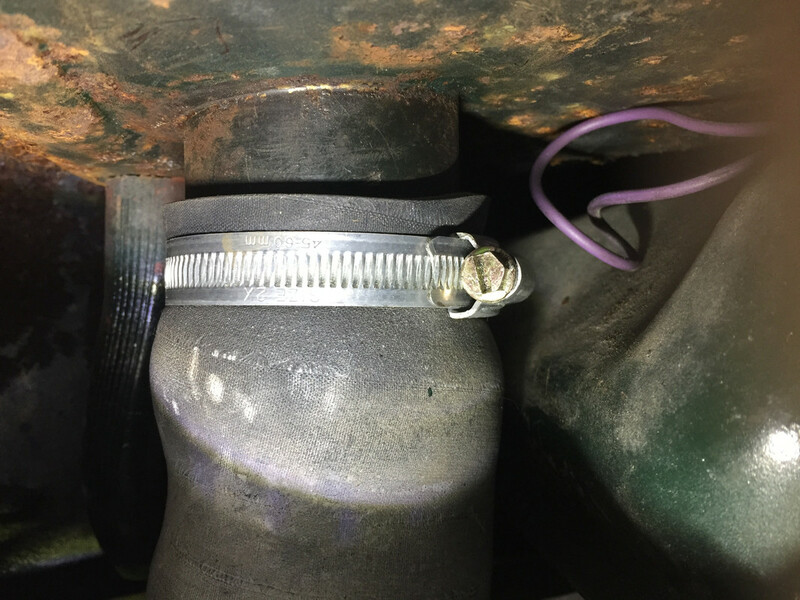 If you run your hand up the short fat rubber hose that connects the fuel filler to the tank towards the filler, where that rubber hose ends you'll find (or should find) a small length of metal pipe sticking out. That's where you need to connect to. The reason the hose in the SNG listing looks short is because the official hose is short just running between the two pipes it connects to. However, it isn't the easiest hose to fit - along with it's bigger fat brother the filler hose so it's easier to use a longer length of hose. That way, with the tank out you connect the hose to the small pipe on the side of the filler pipe (the one you haven't found so far). You then place the fuel tank in place but not fully over to the left so the small pipe sticking out the top of the tank is still exposed and connect the other end of the hose to it. You can then slide the tank fully over to the left and only have the joy of fitting the large filler hose as the small hose is already fully connected. Thanks, the mystery deepens. Just had a quick look and the pipe that you describe on the filler neck doesn’t seem to be there- see image below. I have 2 swb fixed head coupes, both reimported from the US. one 68, the other 69'. One has the smaller overflow pipe on the fuel filler and one doesn't. They also have different fuel tanks, one with and one without the corresponding pipe. I had the same fuel leak you experienced on the one without the second overflow/breather. When I filled the tank up to the very top, fuel would poor on the floor for a bit. Careful inspection revealed it was happening because the lower hose clip was mis-positioned. This was on a brand new tank. The hose clip has to clamp the fat rubber tube at a point the exactly corresponds with the top of the tank filler neck. Thanks James. Looks like I’ve got the tank with the overflow on a car that has a filler neck without the corresponding connection! I’m not sure if it’s a breather or an overflow, but I guess I could try blanking off the hose from the tank and see what happens. I’ll also check the bottom filler hose connection as you suggest. You have a tank that is venting into the car? Yes. Definitely needs plugging pronto! I’m not actually sure where it’s venting yet as I haven’t followed the long hose to the end. But my suspicion is that it terminates in or below the boot. But the tank end was venting inside anyway as the hose was only just hanging on. Thanks! Reading other posts, I think blanking off this vent might create a vacuum that messes up the fuel delivery. The whole thing is a bit of a mess as the filler cap is from a Merc (not vented). I think the answer is to either vent it to the outside but with a high loop in the hose to prevent overflow when the tank is full. Either that or find a way to connect the hose back into the filler neck or hose somehow. Anybody thoughts on this? I had a problem with petrol smell occurring nearly all the time when I got my restored S2. It turned out that changes made to car builds by Jaguar in this area required different fuel filler caps. I got mine originally with a sealed cap and changing it to a vented cap cured the problem. I cannot say whether or not I have the separate vent pipe but there's no piped opening beside the filler cap, only a drain opening to the rear of the cap with nothing connected (looking down under the flap). So it makes sense that a none vented tank needs a vented cap. It just has a small hole through. I had no running problems before the vented cap went on. I think my best bet if I ever want to fill the tank properly is to change the cap for a vented one, then find a way of tapping the filler neck or even the filler hose to connect the vent pipe/overflow from the tank to it (as it supposed to be). Either that or change to an unvented tank, but I'm going to try the plan A first as I know that etypes are built around their fuel tanks and changing them is laborious! Or you could just drill a little 1mm hole in your cap, after all it is covered by the fuel flap. I have taken E type fuel tanks out and put them back a few times. I would definitely have a look, as you may well regret it if you dont. As long as you understand the clearances are light its not too bad at all. I reckon it would take me about an hour to get one out. As I am stuck here waiting, dont mind if I tell you about it! Drain the tank by undoing the small bolt on the sump, then remove the sump (you might be surprised what is in there). Undo the top tank connections (battery disconnected to be safe), I assume you have removed the boards and the spare wheel). Undo the three tank bolts from inside the car. A quarter inch drive with a half inch or 13mm socket is useful here to get on the corner bolt head, as it is a bit tucked away. Remove the 4 half inch nuts on the center tank mount from the IRS side of the boot floor using a ratchet spanner. Remover the center mount from the inside of the car. The rear of the car will have to be at least 10 inches off the ground for you to be able to get on them. Undo the large jubilee clips holding the main filler tube from inside the car. I like to twist firmly and lever the tube up away from the tank to get the filler tube moving, a squirt of WD40 can help here. You should be able to jiggle the tank towards the center of the car now and disconnect any other pipes that are now accessible on the way. I would take a picture of the connections first for reassembly. The tank has to slide all the way to the middle of the car for the tank flange to clear the boot shelf/cover ledge. It is pretty obvious to see when you are actually doing it, the clearance is only a few mm. I would take the time to inspect the overflow pipes, clips. condition of the boot floor and the tank itself. SNG have a good value galvanised tank at the moment. I find that if the sump is full of rust, the tank has probably had it even it you use Slosh and Seal or something like that. Ask me how I know that. You can also get a good view of your inner wheel arch/rear quarter panel condition with the tank out. Worth looking at all this as boot floor lower wing sections are £1,050 built up from Robey, with discount, rear quarters £1,700 (each) and the other associated panels not cheap either. Ask me how I know that too. Some lovely Waxoyle on the boot floor (aerosol version?) is a good idea to protect everything and help the tank slide back into place. It is funny how E types can rust from the inside out at this section where the boot floor joins the rear IRS shelf. As mentioned before, the important thing is to get the big filler tube sliding freely on the upper metal filler tube, which will aid reassembly no end, as you can slide it down onto the tank filler neck easily when the tank is back in position. Make sure you carefully position the lower large jubilee clip as mentioned so fuel doesn't pour into your boot floor when you fill the tank to the max! I have found the replacement filler tube from SNG too wide. I must let Julian know. Wow, thanks for that James- very comprehensive. Sounds like you’ve been there done that. As I haven’t had any actual tank issues apart from the leak when full I’m going to try the breather connection option first with the vented cap. I have fashioned a sealed hose connection onto a new filler hose (my plumbing background) so provided I can get the old one off and this one on it’s worth a try. If not it’s a new tank and follow your instructions!